And although he never actually plays Gomer Pyle in a sketch, the script relies too much on him simply recycling Gomer Pyle’s characteristics, mannerisms, and catchphrases, particularly “Gawww-leeeee,” which recurs again and again. 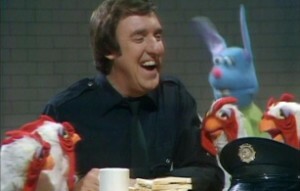 The season 1 head writer, Jack Burns, was from The Andy Griffith Show as well (he played the short-lived character, Warren Ferguson, who replaced Don Knotts) and, given a large number of the guests in the first year were friends of people who worked on The Muppet Show, he likely is the reason Nabors agreed to come on. This is also likely the problem. Rather than challenging his friend at all in sketches that played either against type or found new dimensions for him to play, as would happen with later Muppet Show guests, he gives us exactly what we’d expect. Which is fine if you’re a big Gomer Pyle fan. If you’re not, there’s not much to win you over in his sketches. In a News Flash, he plays a not-particularly-bright gas station attendant who encountered aliens, and later on, he plays a not-particularly-bright night guard at a bakery…which needs one for some reason. This second sketch at least finds some fun laughs at the expense of Nabors’ Gomer Pyle/bumpkin accent. Rowlf arrives at the bakery late at night, and when Nabors demands he holds up his “hends,” he holds up two hens; when he demands that he tell him “what rat [he has] to be here,” Rowlf pulls out a rat, saying that that is the rat he has to be here! Nabors then tells him not to move a hair, so naturally Rowlf pulls out a hare (as in a rabbit) that he then doesn’t move. It’s far from the Muppets’ most sophisticated series of gags but certainly in keeping with Jim Henson’s love of puns, and, significantly, all of the funny bits come from Rowlf, who functions basically as a prop comedian here. Nabors really just provides the accent. Nabors, failing to guard the bakery. And to be fair, there are some good bits, particularly musically speaking. Nabors leads a rousing rendition of “Thank God I’m A Country Boy” as a grand finale, in a barn surrounded by Muppet farm animals, and earlier on, he shows off his operatic range in “Gone With the Wind,” a terrific example of a Muppet musical number that literalizes metaphorical lyrics, a classic Muppet conceit that usually manifests in the first season in the form of Wayne and Wanda but here on a much grander scale (due to song rights, the number is missing from the DVD but you can watch it here). The song is actually about lost love but, as Nabors sings the lines of regret and loss, while standing outside in a country ranch setting–complete with “Muppet Ranch” sign–actual gales of wind begin to pick up, causing the lady Muppet that Nabors is serenading to fly off-stage. Eventually, she fights her way back only to have her hair ripped off her head due to the mighty gusts! By the end of the song, the picket fence and ranch sign are destroyed, she is gone again, and Nabors’ pants have been ripped off to reveal polka-dotted boxers! And speaking of Nabors’ operatic voice, that is the one way in which The Muppet Show distinguishes him from Gomer Pyle, and it appears again in the Talk Spot, which ends with Nabors singing a few chords of Pagliacci so powerfully that he blasts Kermit off-stage through the power of his voice, just as the wind had blown away the Lady Muppet in the earlier song. However, this also points to a number of weaknesses in the episode’s writing. 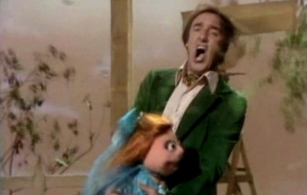 If Nabor’s full-throated operatic voice is capable of blowing Kermit away, why not have had that rather than literal wind be the thing that blew everything away in the opening number? It would have provided better scene-to-scene continuity and even allowed for further development of the dichtomy at the heart of Nabors’ public persona as a comedic point: Nabors is most famous for playing a hillbilly and even grew up in a tiny town in Alabama but also has a rich, beautiful baritone voice, making him a uniquely American blend of low and high culture, and rather than limit that reveal to one gag in one sketch, it could have been central to the episode. Imagine, for example, a scene with Sam the Eagle reacting to this hick he wrote off suddenly busting out in opera and cultural refinement. There’s so much wasted potential here. Burns also oddly chooses Nabors to be the first human guest for Piggy to set her sights on romantically. 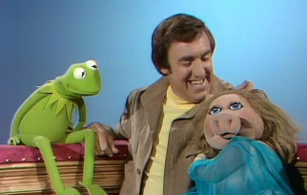 Throughout the run of the series, although Piggy made it very clear that she had claimed Kermit for her own and that no other woman was allowed near him, she also hypocritically threw herself at numerous handsome heartthrob male celebrities who made their way to The Muppet Show. With that said, to put it as kindly as possible, Nabors doesn’t really fit that description. From the enraptured tone Piggy adopts when speaking to him, you’d think she was addressing either the hottest hunk ever to descend from the heavens…or Kermit. “You called, my love?” she cries, flirting outrageously with him, and it feels more like the show buttering up its guest who did them a favor by appearing than an organic expression of how Piggy would actually react. At the very least, Frank Oz plays Piggy in this scene, as he is tending to do more and more at this point, so it sounds right and feels in character, at least in regards to how she’s behaving, while not necessarily to whom. This episode’s other major oddity is that it introduces Scooter to the show–as in, he appears at the Muppet Theatre for the “first time” and asks Kermit, who has never met him before, for a job–even though he’s already been in numerous episodes by this point. There’s a reason for this. As I’ve mentioned before, the fact that the show was syndicated meant that any of the stations that aired it across the globe could decide for themselves which order to air the episodes in. Because the show got progressively stronger as the season proceeded, most of the stations opted to hold off on airing the earliest episodes until later in the year, once its later quality was established. Being considered the best episode of the early set, many markets chose to begin with the Rita Moreno episode, in which Scooter didn’t appear, and so Jim and Co. decided to take the opportunity to introduce him in the next episode before the earlier episodes, where he was already established, aired.